In 1952, realizing Australia was a large country with a small population (then approx. 7m), the fifth Menzies Ministry legislated that only two airlines would be allowed to operate flights between state capital city and major regional city airports. To ensure that both airlines would operate profitably, the two major airlines had to compete on equal terms. This meant that each would operate the same equipment (aircraft) and that fares and schedules would be rigidly controlled over competing trunk routes. The passenger really only had a choice of airline name, as every other feature appeared identical, but TAA had one obvious advantage - its 'Friendly Way' staff. For most of the period of the policy, the "two airlines" were the privately-owned Ansett Airlines and the government-owned Trans Australia Airlines. Like the rest of the world, Australia needed to ensure the success of its aviation industry, before the war there were 39 independent airlines, all regional with links to the major cities and towns, - after the war there were 19 and all apparently unwilling to gamble on the future. Today's air travel bears no resemblance to the early years when flying was considered only for the wealthy, as today air travel is just a form of modern travel, accepted as an everyday event. Frequently asked questions by the younger generation, like "what was it like to fly in the DC3" - always provoke further questions about this era, and what was the difference between the publicly owned airline (TAA), and the competition with a private enterprise airline (ANA - formed by the shipping companies Huddart Parker Ltd and Union Steamship Co. Ltd, and Holyman Bros Pty Ltd). In reality both were operated on private enterprise lines, as government interference in their daily operation was not part of the original agreement, or the legislation that governed TAA, whose charter was to develop air travel and a national network. 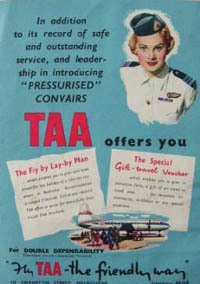 It is true that TAA was financed by the government so that it could establish the airline, but it also inherited the penalty of paying a guaranteed dividend each year to its backer - the Australian government, and hence the Australian people - whilst the private enterprise airline received government subsidies to operate what were considered 'unprofitable' routes and mail contracts. This was not the intention of the government during its consideration to operate an airline and create a national network, and as the popularity of TAA began to grow and profitability was established, the subsidies came under scrutiny, and a method had to be established whereby both airlines would be profitable in their own right. The solution to this dilemma was to legislate, but the future advancement within the industry was severely restricted, and TAA would no longer be in control of its destiny. Both airlines would be limited by an act of parliament referred to as THE TWO AIRLINE POLICY.